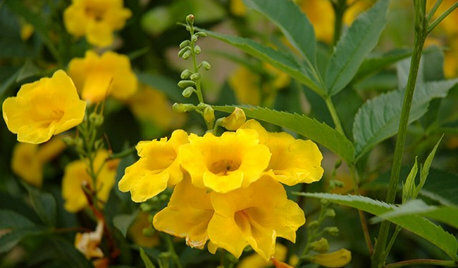 I finally made it to the Cockrell Butterfly Center's fall plant sale and picked up some wonderful 1-gallons: Cassia splendida (Flowery Senna), Passiflora foetida (Love-in-Mist passion vine -- complete with several Gulf fritillary cats! ), Aristolochia elegans (Dutchman's pipe vine), and Asclepias perennis (Aquatic milkweed). Yeah, kinda went crazy: but their selection was amazing, and it's such a good cause! For anyone in the Houston area and a little beyond, I highly recommending hitting this sale -- the folks there do such a great job. Plant sale is usually the first weekend in October and April. I'm going a little pot-crazy in my yard right now, and am just cringing at the thought of hauling these into the garage ahead of a first freeze. Curious what you all do when you pick up plants in the fall: plant them right away and hope for the best, or keep them in pots til springtime? No signs of life. But there is a bunch of life here encapsulated in minute packages. But I will have pictures of my indoor plants before these seeds sprout. That's a mighty deep sleep there, Jay. 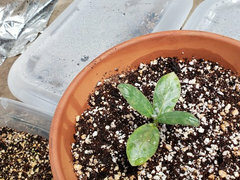 I have 4 Calotropis seedlings. Two are bigger and two are smaller. I sowed 25 seeds. 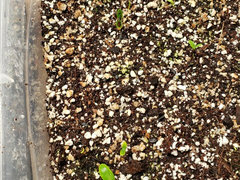 None of the Calotropis gigantea seeds germinated. I think I know where I messed up so hopefully it will never happen again. 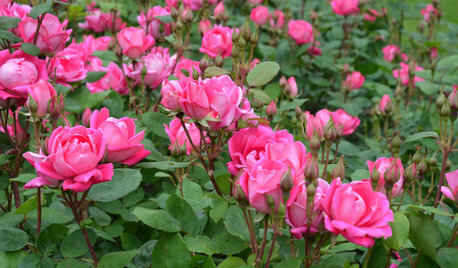 The procera and gigantea look almost identical and the procera is much more fragrant. I only was going to use only 3 or 4 Calotropis plants anyway because they are so huge. The weather here is miserable. It's 13 degrees now. We had snow and then freezing rain and now snow again. The wind was so strong. I'm surprised no rubber bands holding the bin covers on snapped, and there were no tops that blew off. I think the tops were frozen on lol. I'm trying to get the rest of the seeds sowed that I'm going to grow under the lights with the Calotropis. 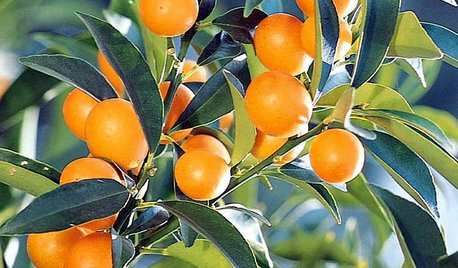 There will be Gomphocarpus physocarpus, Gomphocarpus fruticosa, Gomphocarpus cancellatus, Asclepias curassavica, Dregea sinensis, Ipomopsis rubra. I think that's all. It's hard remembering them all most of the time, no, all of the time lol. It gives me hope to see the seeds I sent you germinating. And we got our Asclepias variegata seeds that everyone is wishing for. You don't really have 2 or 3 months of doing nothing during winter. It seems almost continuous. I like having a three month break but I'm thinking about the weather warming and it's going to be chop, chop so I'm trying to conserve energy and stay healthy for all that. 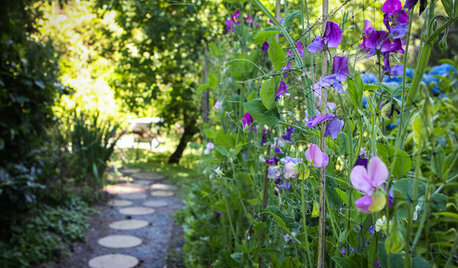 I will have to totally redo my older garden. There are perennials and grasses that needed dividing long ago and it's just basically a big mess right now. I don't know if I'll be allowed to convert the entire hell strip into a prairie. 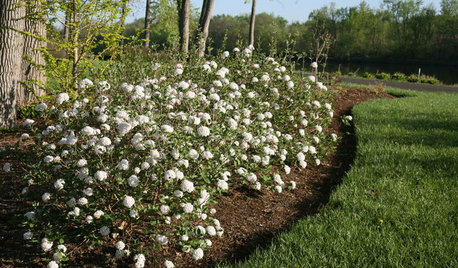 I could plant a portion of it with native plants. A lot of things to do and plan but, it's way too cold outside to be doing anything out there. I hope the Black Swallowtail hatches this spring. I did have a cat once before that made a winter crysalis very early like that. I will have a lot of new butterfly host plants this year. I hope I have a huge variety of catterpillars, and if I should still run out of milkweeds? Is that even possible. Last year was very intense. Worst case scenario, I bring some of the Monarch cats to the prairie down the street that has large colonies of syriacas that never seem to be visited by Monarchs. Now I live just a block away and have way fewer milkweeds. So why did all the Monarchs lay there eggs on my milkweeds and not on the milkweeds at the prairie? Because they knew I would care for their babies? I hope you get rewarded for your patience with spectacular weather during your chop-chop time. 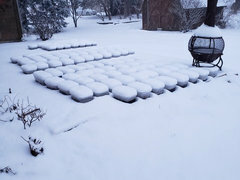 Today, I carried my seedling trays around the house, trying to follow the sun. I'm just shocked at how this set of true leaves was barely showing this morning, and it's now almost 1/2". Guess I'll be spending my time moving trays around -- definite payoff! 7 of 12 variegata have sprouted - so far, so good. I soaked/sowed only 12, thinking if I mess up this batch, I'll get the other 13 going. Does anyone else think like that? 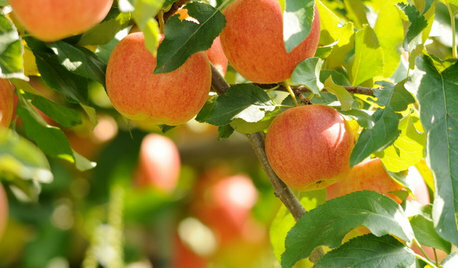 If it's a certainty I should plant these new seeds within, say, a year, maybe I should just bite the bullet and get the remaining seeds chilling. I am not very lucky with seeds, so I don’t do too many of them. If I do, I usually plant half. I often end up with a bunch of leftover seeds that have been in a box for years. I should look through them and maybe just sprinkle them somewhere. 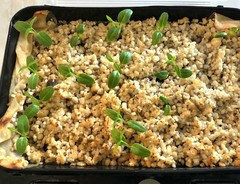 Your seedlings are growing up so fast! It's hard to think straight with so many seeds flying around everywhere. I'm talking a lot of seeds. I totally forget some of the plants I'm growing. Like I just got reminded of one plant today that I already forgot about. It will be a bunch of surprises come spring. Iris, those weed seeds don't have any problems growing in your yard. I know, only the seeds that you plant don't grow. I've had that problem myself. I'm hoping for a big milkweed/Monarch love fest! I had my hands in the seedbags again. I was asked to donate native seeds to a school downstate. I'm afraid they are about to get a crash course in butterfly gardening lol! 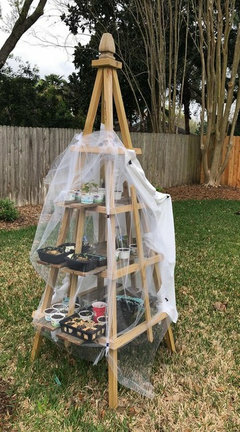 I tried to let the lady know her seeds were on the way, but houzz messed up and I couldn't contact her. Funny how it worked fine when I talked to you and Iris on it, but I've had problems getting back to other people on the houzz messaging. The thing is that with some of the people on here is you don't know where they hang out so you can't reconnect. And then there's that issue with me not being able to blow up pictures on my own thread. I can enlarge them everywhere else just not on my thread. Then there's that thing when I go to press like for someone and then a box with another commenter's name appears. What's that all about??? And just like 5 minutes ago when I tried to comment here my words wouldn't stick inside the comment they are just instantly deleted. Nothing will change unless it gets so bad we can no longer communicate. 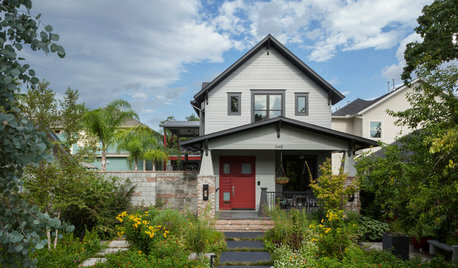 I'm still going to have a good time in spite of houzz. I have surprisingly few problems with this site lately. The only problem being that I did not see the pictures in your last thread when it got too long. Everything else works fine. 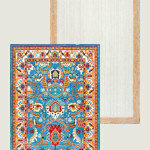 Even attaching pictures when I start a thread (which seems to be a problem for some). Jay and Javi, I really can’t wait to see your flower beds in Summer. Javi, did you start New Mexican sunflowers yet? Mexican sunflowers, that reminds me to start some of the seeds javi sent me. I kept hearing stories about everyones Tithonias taking forever to grow. I need to start some early. Haven't really given much thought to where I'm going to put them. LOL A sunny spot for sure! Yes, Jay, my giant tithonia did great in the full, hot TX afternoon sun. For sure, have the support stakes at the ready. All that time spent (and blood bled) harvesting my tithonia seeds? No need! They're sprouting up everywhere -- far too many for that one spot that, last year, had room for only 1 plant. ETA: And then there's that issue with me not being able to blow up pictures on my own thread. 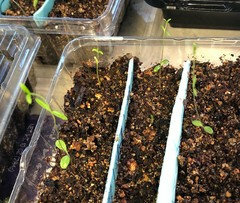 Jay: You realize once you post a pic, it may appear small, but one can click to enlarge (like my shrimpy image of the tithonia seedlings I just posted)...right? Javi, I do click to enlarge and it appears in the box. It just won't ENLARGE!!! I finally got all the potting mix I need. 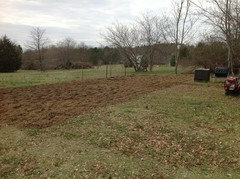 I hope to finish all the rest of the sowing by the end of the weekend. A bunch of rubber bands snapped on the bins so I replaced several today. Very muddy and yucky outside. Two of the Calotropis are bigger and 2 are smaller. There should be more bins joining these seedlings under the lights by the end of the weekend. It's great to be growing the Tithonia and Asclepias perennis because you gave me the seeds. I have 15 more bins to drill. If this doesn't do it, heaven help me!!! Must be something going on with your computer, Jay. When I click on your pics, they get huge -- take up my whole screen, often. 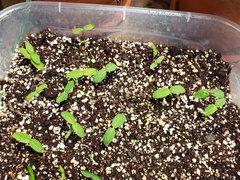 No pressure on the Tithonia and perennis: plenty more where those came from, esp if my (almost 30 right now) seedlings continue to do well. When I insert the pics they get really huge before I hit submit. I'm trying to get the rest of the seeds sown. 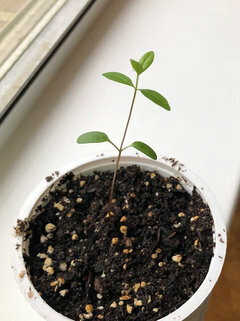 I waited months to get the purple milkweed seeds from Hong Kong. When I finally got them they included free seeds and a picture of tropical milkweed. So I'm assuming they are tropical milkweed, but the seeds are a lot smaller than the other tropical milkweed seeds I have. Iris sen't me some sicklepod senna seeds and her seeds were a lot bigger than the ones I got from China. I'm not sure how they are growing these plants but I don't think I'll be ordering any more north american native plant seeds from Asia. I hear they just discovered a new Monarch colony. I forgot to mention that I poured a very small volume of boiling water on the popcorn cassia seeds to help them germinate. I'll let them sit in water for 24 hours. I was going to rub them on a nail file, but they are little, and hard to grab onto. First of the season...or, last of last season, depending on your perspective. This one took a week (?) longer to emerge than usually, but she (?) looks healthy! As I've gone through and cleaned the yard, I've noticed quite a few old Monarch chrysalises that never made it...died on the vine, if you will -- Mother Nature at work. Wow, you’ve got butterflies! I saw a few little bees and hoverflies today. Made my day. Not a bad start at all, Iris! Just checking in how your seedlings are doing. It’s been raining so much, even the earthworms are crawling up the steps to the porch. Interesting there are entire rows in each container where seeds haven't germinated - wonder what's up with that. The upper left tray ^^ and the following are A. perennis, so I guess I'll have plenty of those! Remember the fence DH replaced? 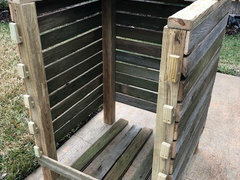 He took the old slats and just finished my new compost bin! Looks like you are going to have plenty of plants to work with. I started some “man of the Earth” sweet potato vine this week. Tried this one twice before without success. Hopefully the third time is a charm. Your husband is really handy. And he is getting things done so quickly! The man loves his power tools, Iris -- any opportunity to fire them up, and he's on it (not that I'm complaining)! I mean, who can argue about an almost-free compost bin? Good luck with your sweet potato vine -- fingers crossed over here. 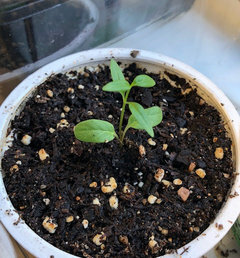 I still have a bunch of store-bought Passiflora Caerulea seeds sown at least a couple of weeks ago, and they haven't done diddly. It was an inexpensive experiment, so we shall see. Jay didn't think my first batch of 'A. asperula'-labeled milkweeds looked very asperula-ish, so I've got batch #2 in the fridge for a quicky cold-strat (almost two weeks). Will pull them out this weekend and use up my last blueberry container. Well, your husband is doing a great job. i didn’t plan on adding different plants to my garden this year. Just maybe some annuals. Jay is getting me into plant buying trouble. Just by mentioning all these plants I have never heard of on the Native Plant forum. 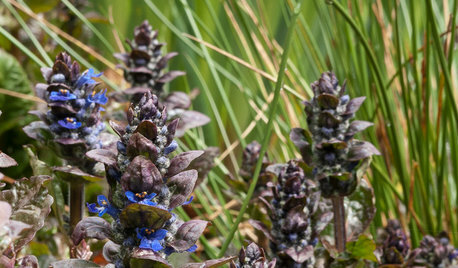 So I look them up, think they are really pretty, useful for some pollinater or the other and native. Next thing you know they are in my shopping cart. I better dig up some space before they arrive in April. This bin has seeds for Rhonda's popcorn cassias, Senna ditymobata, and sensative plant, Mimosa pudica. The plant is obviously neither. 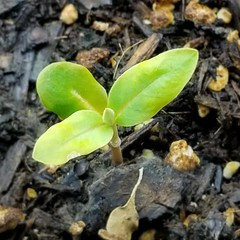 A weed seed in the potting mix. Something in the cabbage/mustard family. It seems I had a species of native Sedum that didn't get sown. I wonder how that happened? Maybe blunders are inevitable lol. The cassia seeds are taking a little longer. My fingers are crossed. Legume seeds are best fresh, and these were very fresh. 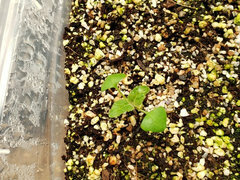 MJavi, your Tithonia seeds germinated before all the others. I have more pictures but I'm having problems posting comments and pictures. It takes forever, or they don't post! I'll try to keep adding the 5 other photos to this comment lol. I will have to repot those Mexican sunflowers soon. Gomphocarpus physocarpus and fruticosa. The 2 species look almost identical. That's a good thing because the seeds got mixed up and I wasn't sure which was which lol. They are just beginning to sprout. I'm getting the numbers I need. We still have about 6 weeks of cold but I got a whif of spring today so the ball is rolling lol. Still a few bins that need cold treatment. We are all going to be a bunch of busy bees this year!!! Calotropis procera, giant milkweed. Out of 25 seeds I have 3 plants. All 3 are C. procera. The Calotropis gigantea and Calotropis procera look almost identical too so I'm cool with just having the procera. The Calotropis procera is the more fragrant of the 2. 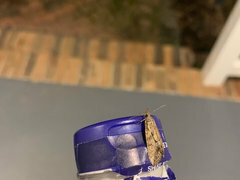 I soaked the seeds of both species in water for 24 hours. 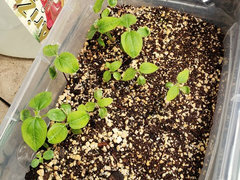 The procera seeds looked like they were starting to pop and the gigantea seeds looked like they maybe needed to soak another day, but I sowed them anyway. My bad. Dealing with hundreds of species and their seeds is a real eye opener! These beauties are Dregea sinensis. The most regal of the milkweed vines I'm growing. I gave some seeds away and got blessed with this in return. Fresh seeds sent from a member in California. I was very worried they might not germinate. But they are healthy and looking great. There are about 18. I'll have to give some away. Tweedia caerulea, (blue) and Tweedia solanoides, (pink). More milkweed vines. Monarchs aren't supposed to like these, I'll research it and let you know. It's the milkweed nerd in me that wants to grow it. I mean, who doesn't want to grow a blue flowered milkweed? It's like a turquoice blue. I can never spell that right lol. There are decent numbers with these too. I couldn't find any takers for the seeds to the pink flowered one so I grew it, but I don't really know, I certainly am not into pink flowers unless they are hot pink like Cuphea cyanea. 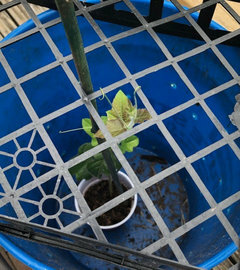 Javi’s seed sprouted first because they were sent with love! You didn’t already start to prepare areas outside, did you? Javi’s looks great. Came across this picture. Just about 3 years old. It looks so small here, but it’s actually pretty big. Except now it’s already out of room. ...and Javi will certainly gobble up any credit thrown her way! :D That area ^^ doesn't look small to me at all, Iris. And if you're out of room, I'm in big trouble over here. We've been hit with quite a number of cloudy days -- with many more to come -- during a time when my seedlings really need some sunlight. 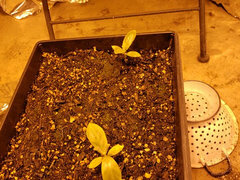 Most of the seedlings have developed their second set of true leaves and are on the way to #3 soon. I don't want to go down the road of grow lights (or purchasing them, anyway), so I scrounged some leftover CFLs (now that LEDs are the thing) and have those bulbs hovering over my seedlings. I don't know if the intensity is enough, what color in the spectrum they are, etc. ; but I guess it's better than nothing. Jay: Wow, it's going to be chop-chop time very soon for you. So great to see all this green popping for you. Remind me: are these tubs your indoor group, or are they the same snow-buried ones you posted pics of? I haven't yet transferred the whorled MW you sent me. Of the 18 seeds I sowed, I've got four seedlings of various heights: but they're all so delicate looking, I don't want to move them yet. 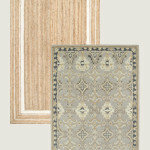 They range from 3/4" to 3-1/2" -- do they look OK to you? At least this one ^^^ is supporting its own weight ok. The speciosa/showy are really doing the lean! 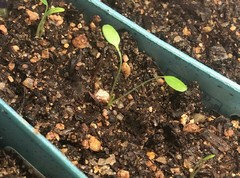 Remember when the asperula first appeared (or what I thought was asperula); and I started that second batch of seeds just in case? 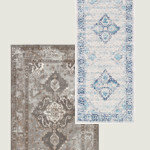 I cold-stratified them 2 weeks then sowed into media Feb. 23. They're sprouting this morning, so in a few days I should be able to compare the batches. Great thing about them is they're malleable, so will conform to any container I keep them in. The verticillata look very healthy. These seeds I'm growing under lights are seperate from the ones outside. I'm doing a few more to put outside now. Outside is where the motherload of milkweeds is. 27 species, 30 bins. I like the coffee filter idea. I might have to use it lol. The cfl's have the blue light plants need. They will help give the seedlings extra light. They are fine to use temporarilly. That's good news, Jay, as I have an entire box of CFLs! 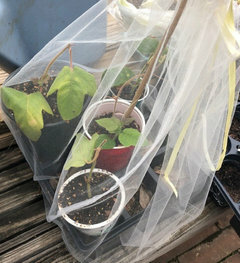 I just realized I forgot to label my coffee filter transplants: those are the variegata I purchased online. So far yielding 7/12. I scraped around in the seed tray where the other 5 seeds were sown, and I see not sign of them. Have your variegata come up, or are they part of the outdoor bunch? Great job with your “peat pots”! 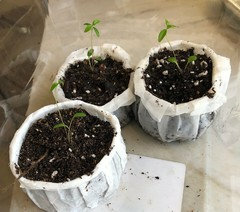 I have used coffee filters as liners for pots before so the soil doesn’t fall out. I was just wondering if I even need more plants. Kidding, but when I just opened the refrigerator there was a moth trying to get into the ranch dressing. So many questions. How did it get in there? How was it not too cold to want to eat? Well. He/ she got kicked out. It’s warmer there tonight. 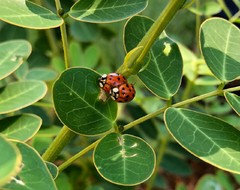 So, not only do you get cats on every friggin plant in your yard , you get them in your salad dressings; talk about luck!!! The variegatas are part of the outside bunch. I sowed 60 seeds. If I have more than I need I'm going to retreat to my compound and become a hermit lol! 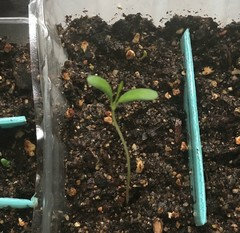 Javi, just curious if you did compare your seedlings. 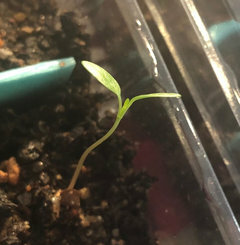 I got one seedling out of my “man of the Earth” sweet potato vine seeds. I hope I am not going to love it to death hovering over it. I haven't yet, Iris. Only 2 of the 10 seeds from asperula batch #2 sprouted, and they've not sprouted true leaves yet. But progress on this end nevertheless, as I've moved almost all the seedlings outdoors. 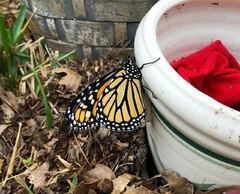 Monarchs, frits and sulphurs are already fluttering about! My mini-grove of tithonia is getting so thick in this warm weather, I spent yesterday transplanting 10-12 all around the yards. I need to make sure I have enough stakes on hand, now that I know how huge and top-heavy they get. Really excited to think about all the activity these beautiful flowers will bring this year. What are your numbers for the other milkweeds javi? I think I'm good on tropical and swan milkweeds. My purple, whorled and variegatas are still waiting outside. I have 16 Tithonias. There are some seeds left. They are growing like they are on steroids! This is looking great! Is this a little passion vine on the top? My goodness, Iris -- what an eagle eye you have! That is indeed a passiflora foetida cutting I took off the mother plant last fall (when the original started to look awful). I've got a couple more indoors in water. No roots yet, but new leaves are already sprouting. Wow. You are ready to feed an army of caterpillars. 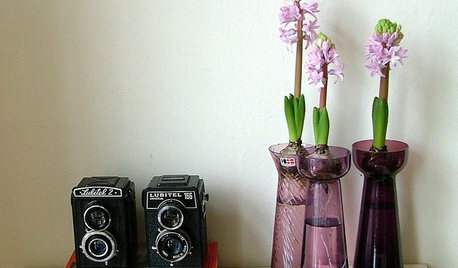 Don’t forget to share pictures along the way! Cool! Is that the species name splendida? Wow! there's a lot of cassias! 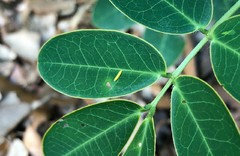 I'm getting seeds for yet another one, Senna occidentalis. 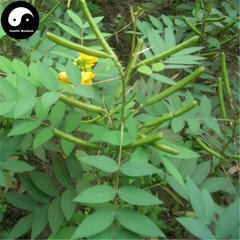 It's native, called coffee senna. I'm growing lots of legumes for the sulfers. Wow again.That Senna looks ready to feed an army. You are going to run out of room for plants again soon! Jay: Yes, splendida -- at least that's what the museum butterfly center labelled it as. Iris: When so many eggs were laid those first few days, I was concerned my senna wouldn't grow large enough to support most of the hatched cats. 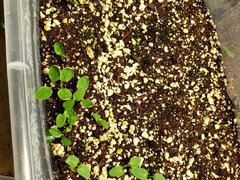 So, I also planted a couple of popcorn cassia seedlings (sprouted from seeds Rhonda sent). There have been a lot of wasps combing every leaf, and I didn't end up with nearly as many cats as I'd thought -- those wasps, anoles, and lady bugs (probably) are just doing too good a housekeeping job cleaning up all the baby cats. :( It turns out there's more than enough leafage to go around. If the new bed gets too crowded, it may be yank-and-cull time next year. However, I did spend the past several days creating a couple of new beds. :D Still plenty of lawn turf to encroach upon! I'm squinting. Wow, that's a nice bed. I planted s bunch of stinging nettles yesterday for the Red Admirals. There was this little one darting around me the whole time. The nettles are next to the rue and common milkweeds. My swamp milkweed is coming back, still haven't seen any common milkweeds. Did you get my message? Javi, how are those pipevines you got from your neighbor? I had to crawl over a bunch of stuff to get to the butterfly cage with the swallowtail crysalis in it. I'm hoping it hatches. I had no swallowtail cats last year. Yup, Jay -- just replied to your email. Several weeks ago, butterflies were everywhere: sulphurs, frits and Monarchs. I keep catching glimpses of black swallowtails and, once, a pipevine swallowtail (telltale shiny turquoise body)....so cool. For some reason, they've all disappeared! At first, I wondered how the black SWTs hadn't yet found my massive fennel bush (bushes, I guess - bought a 4" pot that contained 3-4 plants -- stuck it in the garden and it's grown to 3'x3'...it's a monster!). Upon closer look last week, there were two 3rd to 4th instar cats happily munching away! 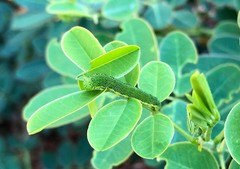 I actually saw a small, brown snack among the branches too -- DH said it was harmless, but first time for me! Very excited about the white veined pipe vine! Will take a pic tomorrow, but flowers are already forming, and it's leafing out nicely. I snipped a small branch to see if I can't root it in water. I buried a couple of stems in the potting soil, in attempts at propagation by layering. Wonder how long that takes? I inspected one stem today, but it hadn't rooted yet; soil has remained moist. Smells skunky -- maybe that's how the butterflies find it. What was the "brown snack"??? Oh! You mean the seeds? I labelled them for you! Javi, my Rue stays green for the most part all the time and is about to flower. So your freezes shouldn’t faze it. My white veined Pipevine is finally starting to come back up. Seems they have plenty of volunteer seedlings, so you shouldn’t have to worry if your cuttings work. My wooly Pipevine is getting little pipes. So cute. Iris: I'd read rue generally doesn't do well in our TX heat (so, what's new, right? ), so I made sure to plant in a semi-shady area. I love this plant's leaves, and it's too bad the shady areas are wayyyyy towards the back of the yard. It was stormy last Saturday, so I was stuck in the house...stumbled upon woolly pipe vine + doable in TX. 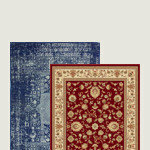 It's already on my 'maybe wish list' for next year. We'll see -- need to make sure I can handle what I already have going. My neighbor friend who gave me the white veined cutting also gave me a bunch of seeds. She wished me luck as she was never able to propagate from seed. I've tried a couple of batches since last year, and nothing has sprouted. Am banking on cuttings. A far as self-sowing, right now the PV is in a pot where I can keep an eye on it. 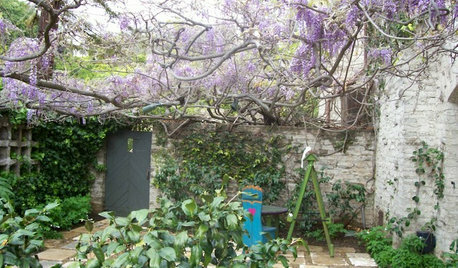 Again, someday I'll plant in the shady area, but I'd like to get a couple of plants going and vibrant first. I have read that the Pipevine seeds have to be really fresh. I have them showing up 15 feet from the original spot, so maybe they will show up somewhere for you. Looks like you are always sending me your storms. It was stormy last Sunday and is supposed to tomorrow. Where does an Electra glide go from here? 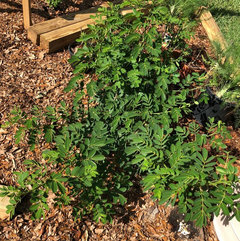 How to plant Pride of Barbados seed pod? 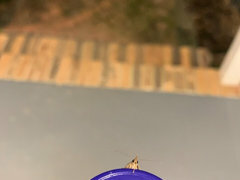 Photos around my yard - Dallas area.